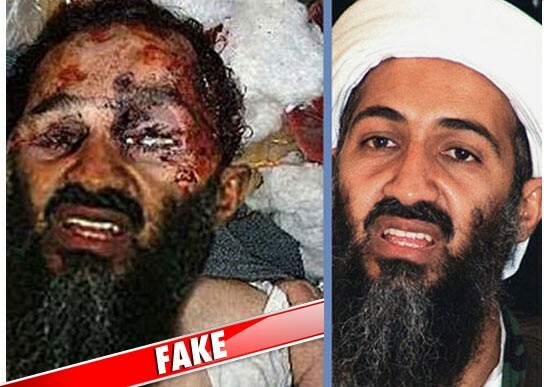 The image on the left is an ALTERED version of a famous photo of bin Laden. The White House has NOT released an official death photo of the corpse ... yet....An official has told CNN ... REAL photographs of Osama's body exist ... which show a gunshot wound to the side of his head. The official says due to the wounds, bin Laden's face is "unrecognizable." Every time the US waves the bloody shirt of Osama, it has a purpose. Obama has been drastically weakened in recent months, and the US has been hurt by murdering Gadaffi’s family members. The mass-killing in Afghanistan, Iraq, Pakistan, etc. is not going well. The economy is a wreck. Dollar debasement is speeding up. Gasoline prices are high. So…tah-dah…the body of Osama bin Laden for our edification and distration. It may even be true. Certainly the CIA will assure us that its DNA test proves it. 1) Congratulations to the United States government on spending only ten years and a few trillion dollars to kill one old man. 2) This means we get all of our liberties back now, right? And our money? And the thousands of lives lost? 3) Ah, now the Libyan war is beginning to make a lot more sense from a political standpoint. The government needed a new bogeyman to chase. At least I can count on LRC not to be oozing with “hooray for government murder” pablum like my Twitter feed is overflowing with. Osama bin Laden was holed up in a two-story house 100 yards from a Pakistani military academy when four helicopters carrying U.S. forces swooped early Monday, killing the world’s most wanted man and leaving his final hiding place in flames, Pakistani officials and a witness said. They said bin Laden’s guards opened fire from the roof of the compound in the small northwestern town of Abbottabad, and one of the choppers crashed. However U.S. officials said no Americans were hurt in the operation. The sound of at least two explosions rocked Abbottabad as the fighting raged. Abbottabad is home to three Pakistan army regiments and thousands of military personnel and is dotted with military buildings. The discovery that bin Laden’s was living in an army town in Pakistan raises pointed questions about how he managed to evade capture and even whether Pakistan’s military and intelligence leadership knew of his whereabouts and sheltered him. Critics have long accused elements of Pakistan’s security establishment of protecting bin Laden, though Islamabad has always denied this. Army and government officials gave no formal comment Monday. Most intelligence assessments believed bin Laden was holed up somewhere along the lawless border area between Pakistan and Afghanistan, possibly in a cave and sheltered by loyal tribesmen. That region is remote, homes to soaring mountains and the Pakistan state has little or no presence in much of it. It was not known how long bin Laden had been in Abbottabad, which is surrounded by hills and is less than half a days drive from the border region with Afghanistan and two hours from the capital, Islamabad. It was also unclear how much of a role—if any—Pakistani security forces played in the operation. A Pakistani official said the choppers took off from Ghazi air base in northwest Pakistan, where the U.S. army was based to help out in the aftermath of the floods in 2010. Pakistani officials said a son of bin Laden and three other people were killed. Other unidentified males were taken by helicopter away from the scene, while four children and two woman left in an ambulance, the official said. He said the house was 100 meters (yards) away from the gate of the Kakul Military Academy, an army run institution where top officers train. A Pakistan intelligence official said the property where bin Laden was staying was 3,000 square feet. Last summer, the U.S. army was based in Ghazi to help out in the aftermath of the floods. Pakistan has in the past cooperated with the CIA in arresting al-Qaida suspects on its soil, but relations between its main intelligence agency and the CIA had been very strained in recent months amid tensions over the future of Afghanistan. In late January, a senior Indonesian al-Qaida operative, Umar Patek, was arrested at another location in Abbottabad. News of his arrest only broke in late March. A Pakistani intelligence official said its officers were led to the house where Patek was staying after they arrested an al-Qaida facilitator, Faisal Shahzad, who worked at the post office there. Osama Bin Laden is dead, President Obama announced Sunday night, in a televised address to the nation. His death was the result of a U.S. operation launched today in Abbottabad, Pakistan, against a compound where bin Laden was believed to be hiding, according to U.S. intelligence. After a firefight, a small team of American forces killed bin Laden and took possession of his body, the president said. “Tonight I can report to the American people and the world that the United States has conducted an operation that killed Osama bin Laden,” Obama said during brief remarks at the White House. “Justice has been done,” he said, in comments that marked a formal end of the manhunt for the most visible and emotionally-charged symbol of the terrorist attacks of Sept. 11, 2001. The president said U.S. intelligence operatives received a tip in August on bin Laden’s whereabouts, which ultimately led to Sunday’s attack. Obama said he determined last week that the U.S. had enough reliable information to take action; by Sunday morning, he had authorized “a small team of Americans” to conduct an operation targeting bin Laden. Both Bill Clinton and George W. Bush had targeted bin Laden during their presidencies, and both had failed to either capture him or kill him. The failure to snare bin Laden weighed most heavily, perhaps, on the Bush Administration, which occupied the White House during the 9/11 attacks, and the al Qaeda leader’s killing falls exactly eight years to the day when Bush famously declared “Mission Accomplished” in Iraq. Bush said in a statement that Obama called him Sunday night to inform him of “the momentous achievement” of bin Laden’s death. In a conference call with reporters just after President Obama spoke, senior administration officials provided a detailed sketch of how the intelligence on bin Laden’s whereabouts was gathered. Intelligence officials had been conducting lengthy reconnaissance work prior to receiving their key tip in August. According to senior administration officials, suspected terrorists in custody since 9/11 -- including the attack’s mastermind, Khalid Sheikh Mohammed -- identified a courier who had a close relationship with bin Laden. When the intelligence community finally pinpointed the courier’s location, they were “shocked by what we saw,” said this official. The neighborhood in Abbottabad was “relatively affluent with lots of retired military,” this official continued, and was insulated from urban areas or places susceptible to natural disaster and terrorist attacks. The home was “roughly eight times larger than the other homes in the area,” and it was surrounded by 12-to-18-foot-high walls, topped with barbed wire. It had two security gates and a value of roughly $1 million, although it lacked telephone and Internet connections. An even more telling clue for intelligence operatives: The occupants of the house were burning their trash rather than putting it out for collection. One senior administration official suggested bin Laden had been staying at the compound for at least six months without moving. Bin Laden was known to have regularly shifted locations to evade capture, so it’s unusual that he chose to stay in on spot for such an extended period. The president made the decision to undertake the operation at 8:20 a.m. on April 29th in the White House’s Diplomatic Room before he left to survey tornado damage in Alabama. Tom Donilon, his National Security Advisor, prepared the formal orders and convened the principals at 3 p.m. that same day to complete the planning. The next day, without giving off a hint of the weighty operation being planned, Obama prepared for and delivered his address at the annual White House Correspondent's Association dinner. The next morning he played nine holes of golf. Final preparations were made on Sunday. At 2 p.m., the president met with top advisers for an hour and half, at which point he returned to the Situation Room for an additional briefing. Twenty minutes after that, he learned that bin Laden had been “tentatively identified.” By 7 p.m. he was told it was highly probable that bin Laden was at the compound. By 8:30 p.m., he received an additional briefing. He signed off on the attack after that. No other intelligence operatives in other countries were told of the attack before it occurred -- including Pakistani operatives -- according to administration officials. Vice President Joseph Biden informed congressional leadership of the attack shortly before it took place, aides on the Hill told the Huffington Post. Details about the fight itself are still difficult to come by. According to local reports in Pakistan, a helicopter involved in the attack had a mechanical problem and crashed. U.S. forces intentionally destroyed the remainder of the wreckage to reduce signs of their presence in the area , according to NBC and other media reports. Two helicopters remained to provide cover for Joint Special Operations Command forces; in addition, there was a predator drone. The fight lasted only 40 minutes and was described by a senior administration official as a “surgical raid” conducted by a Navy Seals unit. Bin Laden's adult son was killed, as were two of his couriers and a woman being used as a human shield. Bin Laden himself “did resist the assault force,” a senior administration official said. Reports on Sunday night said the terrorist leader was ultimately shot in the head. Officials warned that in the aftermath of the attack, Americans should be on alert for a reprisal from al Qaeda. However, one official added, there were “no specific threats" as of Sunday night. ABC News reported that authorities plan to bury bin Laden’s body at sea in order to leave no definitive location for his final resting place. It will be done, an official added, “in accordance with Islamic practice and tradition." Hours later, CNN reported that the burial had taken place.